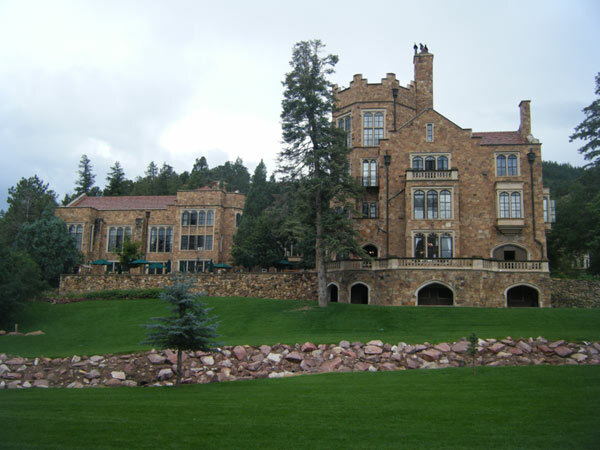 Located in narrow Queen’s Canyon just north of the geological formation known as the Garden of the Gods, Glen Eyrie is the estate of General William Jackson Palmer, the founder of the Denver & Rio Grande Railroad (D&RG) and the city of Colorado Springs. What began as a relatively modest clapboard home in 1871 had evolved into the sixty-five room "castle” by 1906, with multiple improvements in between. Both Frederick J. Sterner and Thomas MacLaren, each a prominent architect in Colorado, had a hand in the evolving design of the nearly 50-acre complex. In addition to the Tudor Revivial main house, the district includes a gatekeeper’s house, schoolhouse, large carriage house, two power-generating plants, gardener’s house, dairy, granary, and many surviving historic landscape features, such as bridges and a rose garden. First listed in the National Register in 1975, the historic district was expanded in 2016 to encompass additional buildings commissioned by Palmer to complete his self-sufficient estate.